Awhile back, we attended a social gathering where they served drinks and appetizers. 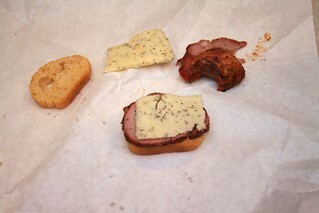 One of the appetizers was toasted baquette pieces topped with a small piece of beef and horseradish. I filed that away as something that I wanted to try to put a BBQ spin on. So last Saturday night, I had a chance to do just that. 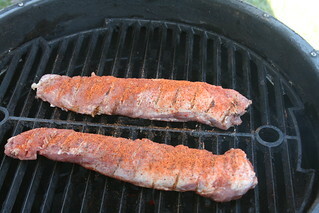 I grilled a couple of pork tenderloin on Saturday morning. I then wrapped them and placed them into the refrigerator to chill. It's much easier to slice them thin when they are chilled than it is when they are warm. I then placed a piece of tenderloin on toasted baguettes, and topped each with a slice of a Harvati Dill cheese that my bride is fond of. 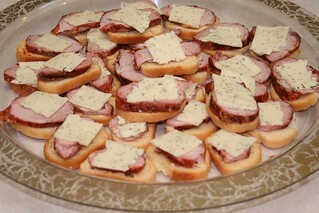 They make a great finger food and were a big hit at the gathering that we took them to. Feel free to experiment with this. I think these would be good with a dollop of a spicy or flavored mustard or something simialr as well.